If a centerfire rifle bullet passes through an intermediary target, such as a wall or door, before striking an individual, the severity of the wound produced may be much greater than if the same bullet had not perforated the target. If the intermediary target is of sufficient thickness and resistance, the bullet will destabilize; be deformed or even break up. Such a bullet — when it strikes the victim — will more readily lose kinetic energy, thus, possibly increasing the severity of the wound. This is true even though the bullet has lost kinetic energy in piercing the intermediary target. This phenomenon is most pronounced in hunting bullets which because of their design and construction more readily deform and breakup. 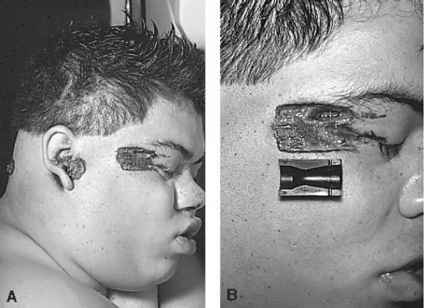 If multiple intermediary targets are perforated or if the intermediary target is very resistant, e.g., steel plates, the bullet may lose so much kinetic energy in passing through these targets that the wound has the characteristics of a handgun wound. Almost invariably, the entrance produced by a bullet that has perforated an intermediary target is atypical in appearance with a large, irregular entrance hole surrounded by an irregular, non-symmetrical, often wide, abrasion ring. In passing through the intermediary target, the bullet, whether it be full metal-jacketed or hunting, may shed fragments of metal or even break up. If the individual is close to the intermediary target, they may be struck by fragments of the bullet and/or intermediary target. If the main mass of the bullet is intact and produces a single entrance, the skin around the entrance site may be "peppered" with small fragments of metal broken off the bullet and/or fragments of the target (Figure 7.17). 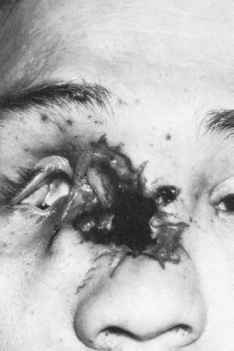 Figure 7.17 Large irregular entrance wound of the face from centerfire rifle bullet that passed through intermediate target. Stipple marks around entrance caused by fragments of bullet and intermediate target. 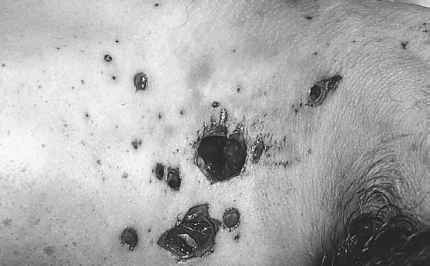 Figure 7.18 Multiple entrance wounds of top of left shoulder from .270 soft-point bullet that broke up after perforating wall boards. The two largest defects are the entrance sites of the core and jacket. two entrances. More commonly, both the jacket and core are torn apart and multiple, sometimes scores, of fragments impact the skin. Figure 7.18 shows entrance wounds, on the top of the left shoulder, from a single .270 soft-point hunting bullet that passed through two layers of wallboard. The deceased was bending over at the time he was shot facing the wall perforated by the bullet. In passing through the wall, the core and jacket separated producing the two large entrances. Fragments of jacket and core produced the rest of the wounds. In Figure 7.19, the deceased was struck by two 7.62 x 39 mm full metal-jacketed bullets having steel jackets and lead cores. The bullets perforated the wall of a frame house and a sofa before striking the deceased. Both the jacket and core had fragmented prior to striking the deceased. A bullet may carry large fragments of an intermediate target into the body. Figures 7.20 and 7.21 illustrate the case of an individual shot through an automobile car door with a .30-30 hunting rifle. The main mass of the bullet remained intact, penetrating into the chest and causing death. A small fragment of lead core also penetrated, with another fragment producing a superficial wound of the skin. In exiting the door, the bullet carried with it a large piece of steel, which in turn inflicted a fourth, penetrating wound. This piece of steel was recovered from the muscle of the side, not having penetrated into the chest cavity. Figure 7.19 Two entrance wound complexes from two 7.62 x 39 bullets that broke up after perforating wall of house and sofa. Each entrance consists of a cluster of wounds from a fragmented bullet. 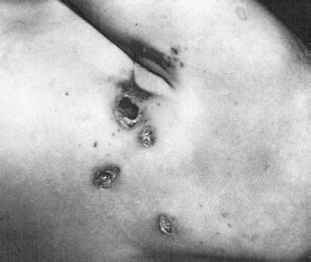 Figure 7.20 Bullet and shrapnel wounds of left side of chest from .30-30 rifle bullet that passed through car door. 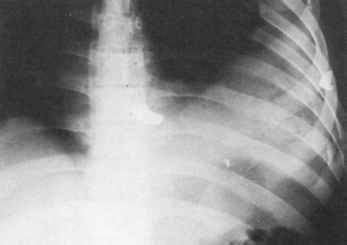 Figure 7.21 X-ray of chest showing bullet in midline with steel fragment in left side of chest. If a bullet perforates an intermediary target of suitable resistance, the impact may be sufficient to vaporize lead from the core which is then propelled forward with the bullet. This lead can be deposited on a surface behind the entrance if the surface is in close enough proximity to the intermediary target. 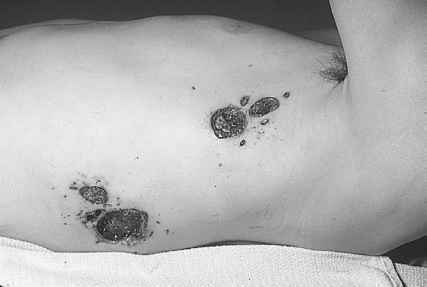 The lead deposit around the second entrance can simulate soot such that the wound is mistakenly interpreted as a contact or close range. This phenomena was described by Shem.7 In his case, a .270 soft-point bullet perforated the sheet metal wall of the cab of a pickup truck before striking the driver. The bullet hole in the deceased's jacket was surrounded by vaporized lead simulating soot. Shem reproduced the same effect with a soft point .308 bullet. If the bullet had a full metal jacket, however, no deposit occurred. In variance with this last observation in regard to full metal jacketed bullets, Dodson and Stengel reported a case of a full metal jacketed 7.62 x 39 bullet, that after perforating a window pane and a curtain behind the glass, deposited vaporized lead on the surface of the curtain facing the glass, i.e., the entrance side of the curtain.8 They were able to reproduce the phenomena experimentally. The lead vapor around the entrance in the curtain apparently came from the exposed lead core at the base of the bullet. A report by Messler and Armstrong described lead residue sprayed backward, rather than forward, when a bullet perforated a firm intermediary target.9 The circumstance described was the reverse of that encountered by Dodson and Stengel. A rifle bullet perforated a window shade and then a pane of glass. A deposit of melted lead particles simulating soot was observed around the hole in the shade, but on its exit side, i.e., the side facing the glass. Thus, the bullet perforated the shade and then the glass, at which time melted lead particles were sprayed backward from the bullet onto the shade. This phenomena was reproduced experimentally for lead bullets and bullets with an exposed lead tip but not for Silvertip® or copper jacketed bullets.